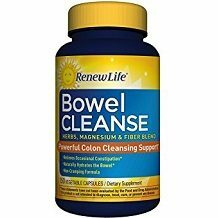 This is a review of RenewLife Bowel Cleanse. This product claims to help cleanse the colon, promote regularity, relieve occasional constipation and help eliminate waste and toxins from the body so that you can feel better, lighter and more energized. The product is dairy and soy free in a vegetable capsule. We found that all the natural ingredients, such as Papaya Leaf which contains papain to help break down proteins and boost a healthy digestive system to be great! RenewLife Bowel Cleanse directs you to take 5 capsules in the morning. It also gives the option to repeat this in the evening. It recommends drinking plenty of purified water while taking it. We feel this dosage to be very excessive. We are not sure what research has taken place with regards to dosage but in comparison to other similar products on the market, we felt the option of up to 10 capsules a day is way too much. 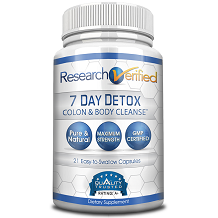 It states that it may be taken for 30 consecutive days for a total colon cleanse. There are 150 vegetable capsules per bottle. This product should be kept away from children under the age of 18. It is not meant to be taken if you have an obstructed bowel. It is advised to consult with your physician before starting this particular product. It is not meant for consumption whilst pregnant or nursing. As this product contains rhubarb, it may worsen any sort of diarrhea, loose stools or abdominal pain you may have. It is also not recommended for prolonged use. The price of this particular product is $19.99 and if you sign up for auto delivery, you will receive 15% off the product price as well as free shipping. If you sign up for auto delivery you will receive an email before each delivery and you will be able to join or cancel at any time. The options for automatic delivery are 4, 6 and 8 weeks and 3 and 6 months. RenewLife Bowel Cleanse offers you a 60-day complete money back guarantee (minus shipping and handling costs) based on poor quality in manufacturing. We found this guarantee to be very vague as it does not reassure you that you will get your money back if the package has been opened and you are not satisfied with the product based on usage. This product has great natural ingredients and is priced well. We feel though, that auto delivery is not such a good option for this particular product as the product clearly states it is not for prolonged use. Also, the only option of getting a discount is by signing up to auto renewal. What was also worrisome is the fact that it states you can take up to 10 tablets daily which, when compared to similar products on the market, seems to be excessive.